ATV-Quads is the Home of the Super Fast delivery!! Lowest Price in the USA!! CALIFORNIA LEGAL! The JetMoto 110cc has a Honda Clone equipped engine, dual inverted fork front suspension, hydraulic disc brake, and a top speed of up to 30+ Mph. 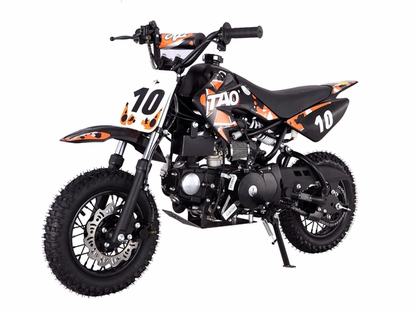 It is the "little brother" to the JET MOTO 110-x. This bike has the similar seat height as the 70cc models (26") we offer for those that want a little more power in a an economical price. Easy-to-use power and amazing durability. It’s the best of both worlds for a beginning rider. Designed to build rider confidence with it's low seat height (26") to its light weight, to the easy-to-use Fully-Automatic transmission and Electric Start. The proven automatic transmission allows riders to concentrate on riding without the worry of a manual clutch or stalling. This model comes in Red, Blue, Orange and Green. This Semi-Auto Dirt / Pit Bike comes with an upgraded suspension. This model has upgraded alloy rims for reduced weight and better performance. This Dirt / Pit Bike is equipped with a rugged heavy duty chain and sprocket. These work together for the highest durability and performance. This Pit Bike is equipped with a Fully-Auto transmission which allows the rider to ride without a clutch. Just gas and go!! The Bike is also equipped with a 110cc 4-stroke engine that delivers lots of power and has a 30 MPH+ speed capability. The 4-stroke engine is durable and super dependable with the convenience of no oil mixing, just gas it up and go. Solid High Quality Front Forks provides a stable suspension and a much more comfortable ride. Hydraulic Front Disc Brake provides ultimate stopping power. **Always wear a helmet, eye protection and protective clothing whenever you ride.